A team of international scientists, including researchers from the University of Manchester, have announced the discovery of a new species of Cretaceous-aged spider. The arachnid (Class Arachnida), which was preserved in amber from Myanmar (burmite), is helping palaeontologists to better understand the evolution of these very successful and diverse, eight-legged invertebrates. This new spider species, named Chimerarachne yingi possessed a whip-like tail, a characteristic associated with ancestral forms and the most primitive types of extant spider, but the burmite has preserved a spider with this characteristic, that lived at least 250 million years after the first spiders evolved. Chimerarachne yingi dorsal view (a) with accompanying line drawing and (b) ventral view with accompanying line drawing. The characteristics of today’s spiders are very well known. These creatures have eight legs, several eyes and can spin silk, often to create cobwebs. A “whip-like tail” is one feature that you would not normally associate with these particular creepy-crawlies. The researchers, writing in the academic journal “Nature Ecology and Evolution”, conclude that the specimen might represent a transitional fossil, it possesses a tail (flagellum) and as such, the fossil may help scientists to better understand how the Arachnida evolved and diversified. Transitional fossils are defined as any fossil that demonstrates traits that are common to both an ancestral group and descendants. Perhaps the best-known example is Archaeopteryx lithographica from the Late Jurassic of southern Germany. The “Urvogel” shows both reptilian traits and characteristics of a bird, so it is regarded as a transitional fossil highlighting the evolution of one part of the Theropoda into modern Aves (birds). The genus name comes from the Greek chimera – a mythical beast that was made up of parts from numerous animals. The research team conclude that this new species belongs to an extinct group of spiders which were very closely related to true spiders. 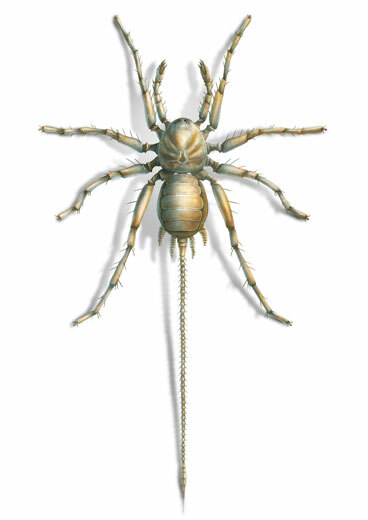 What makes the fossil so unique, and different to spiders of today, is the fact it has a tail. The discovery sheds important light on where modern spiders may have evolved from. The Arachnida is an extremely successful class of invertebrates. Spiders are the most diverse and numerous of all the arachnids, together spiders are grouped into the Order Aranae, some 47,000 living species have been documented. Their evolutionary origins are obscure, but the first spiders may have evolved in the Late Devonian. 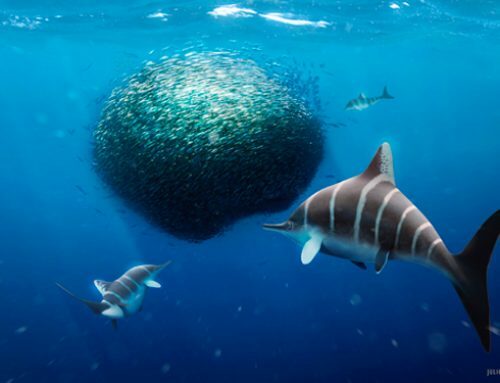 Over hundreds of millions of years, they have evolved several key innovations found only in this group. These include spinnerets for producing silk for webs (as well as for other purposes like egg-wrapping), modified male mouthparts (pedipalps), unique to each species, which are used to transfer sperm to the female during mating, and venom for paralysing prey. Chimerarachne yingi illustrated (note the whip-like tail, the flagellum). The researchers, led by Bo Wang from the Chinese Academy of Sciences and including Dr Russell Garwood (University of Manchester), state that Chimerarachne yingi closely resembles a member of the most primitive group of modern living spiders – the mesotheles. These spiders have a segmented abdomen unlike other groups found today, such as the mygalomorphs (Mygalomorphae), which include well-known spider species like tarantulas and funnel-webs. Mesothelae spiders are restricted to south-east Asia, China and Japan today, but in the past they probably had a world-wide distribution (across the ancient super-continent of Pangaea). Chimerarachne yingi has several important spider features such as the spinnerets and a modified male pedipalp, but, outside of the obvious tail, it also demonstrates some anatomical differences. For instance, the male pedipalp organ of Chimerarachne appears quite simple, more like that of a mygalomorph spider than a mesothele spider. Chimerarachne yingi illustrated (dorsal view). The team studied the fossil using a range of different techniques. One of Dr Garwood’s roles in the study was to help work out where this fossil sits in the evolutionary tree of the Arachnida. Despite the beautiful state of preservation, the scientists are unable to state what function the tail might have had, or indeed, if this spider had a venomous bite. A timescale showing the proposed evolutionary time scale for the Chimerarachne. Despite its appearance, the research team have concluded that C. yingi is not a direct ancestor of modern day spiders. Spider fossils, although very rare, go back a long way into deep geological time. Instead Chimerarachne belongs to an extinct lineage of spider-like arachnids which shared a common ancestor with the spiders, some of whom survived into the mid-Cretaceous of Southeast Asia. 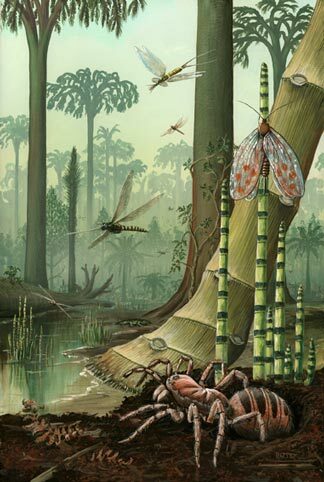 By the Carboniferous the insects and the mostly predatory arachnids were already highly diversified. The scientific paper: “Cretaceous Arachnid Chimerarachne yingi et sp. nov. Illuminates Spider Origins”, by Wang, B., Dunlop, J. A., Selden, P. A., Garwood, R. J., Shear, W. A., Müller, P. & Lei, X published in the journal Nature Ecology and Evolution. Everything Dinosaur acknowledges the assistance of the University of Manchester in the compilation of this article.